Please note: This article superceeds the earlier (1997) version of an article by Walraven van Nijmegen of the same name. The earlier article has been removed from the Laurel site. Ádám Imre. Szabolcs Megye Dadai Járásának Jobbágynevei 1574-böl. Magyar Névtani Dolgozatok no.82 : Budapest, 1989. Iván László. Kalocsa Környékének Személynevei 1560-ban. Magyar Névtani Dolgozatok no.76 : Budapest, 1987. Both books are written in Magyar, but are organized with alphabetical listings which make them useable even if you're not Hungarian. The book on the 1574 census, however, has no index of given names and thus the list you are now viewing was created. Initially I wasn't going to include the names in the 1560 list, especially since the spellings from that source were standardized, but I then noticed there was very little overlap with the list from 1574. It is possible that this is a result of sampling from different classes, but it could also be evidence for regionalism. There is certainly regionalism in dialects today, such that natives can recognize local accents. The most notable characteristic of the names was the comparatively small number of given names relative to surnames. Specifically, in the 1560 census there are nearly 800 surnames, but only 72 given names. Of these 72 given names, only 41 occur more than 10 times in the census. There was apparently a rather small pool of given names from which to draw, so that many people had the same given name. The eastern half of what is today Hungary is mostly flat and surrounded by mountains. At the extreme northeastern end of this plain, at the foot of the Carpathian Mountains, lies the Szabolcs region. At the extreme western end of this plain, 150 miles away near the Danube River, sits the town of Kalocsa. It is these two regions which are treated in the list below. Click on either of the small maps above to view a larger version. The map on the left shows the location of the areas from which the census material comes. The map on the right shows the topography of the Carpathian region. 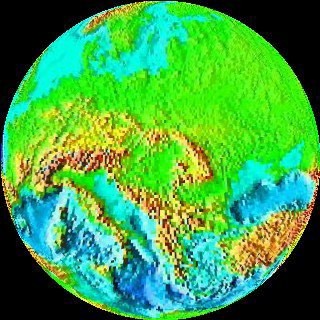 The topographical map above was modified from one generated by Earth Viewer in Switzerland. The other map is modified from the Hungarian home page, where you can find several nice additional sources of information including a list of important dates in Hungarian history. For more information on the Magyar language and pronunciation, try A Hungarian Language Course or Hungarian for Travellers, which includes an interactive dictionary. One important difference between the two source lists is that the author of the 1560 list modernized spellings of the names, whereas the 1574 source list preserves the original spellings. A second major difference between the lists is that most of the names in the 1574 list are names of martyrs, saints and apostles (often in Latin), whereas the 1560 list has few Latin forms and a number of non-religious names, though it does include certain Biblical names not found in the other list. Besides Latin names, the majority of the remaining names have German origins, with a small number of Slavic and French names. There are very few women's names in the list. Nearly all of the women are recorded as "Mrs. so-and-so" by taking the husband's name and adding -ne to the end of his given name. This practice of using a husband's name in formal and official comunication is still used today, though it is beginning to fall out of favor. Obviously women had given names of their own and likely used them among family and close friends, but they are not found in public records. The logical extrapolation is that names of saints and Biblical characters were also used by women, however there are a few names in the list whose endings may indicate that they are feminine forms: Anderja, Berta (Byrta), Bodis, Vitáris. I am by no means certain that all of these are feminine. Both elements are usually a single word, though there are a few surnames which consist of two, such as in the name Kerik garto balynth. In many cases, a surname is identical or very similar to a given name elsewhere in the list and presumably is being used as a patronymic. For more information about the construction of Hungarian names, see my article: Hungarian Names 101. Ádám Imre provides data for frequencies of given names from several census records for comparison. The number following each name is a percent of the total names in the census. Spellings appear to be modernized in these tables. There were a number of difficulties and idiosyncracies to deal with in putting this list together. Magyar makes use of characters not generally available in web fonts, and so certain marks had to be indicated in other ways, and some of the unusual characters in the source material had to be transcribed into "standard" letters. Modern Hungarian has 14 distinct vowels, each represented by a fixed character. These include the usual a, e, i, o, u, as well as á, é, í, ó, ú, ö, ü, and two unique characters: the o and u each with a doubled accent over them. The source materials include some of these, but not all. Because of difficulties in formatting for the web, I have omitted all such marks in the list below, except for umluats and double accents, indicated as o: for ö, and u" for the u with a doubled accent, and so forth. The 1560 material does not list all the names from the original source, but rather a compiled list in which each name element appears but once. This latter list is therefore consistent in its placement of markings. By contrast, the 1574 list is not consistent in placement of accents over vowels, so that there is both a Janos and a János. The 1574 volume also contains two additional vowels which do not occur in the modern language nor in the 1560 work: ÿ and a u with a dot over it. I have dropped these, again because of formatting difficulties, though I have uncertainty in the author's omission of of the "umlaut" on his pages -- in several places it is clear that characters or markings were intended to be added later which could not be created with the typewriter, such as item #705 on page 101: Maÿlat I twan, which should presumably have an elongated s in the given name (Istwan). Additionally, some spelling variants replace the ÿ with i or, in the 1560 list, with ij. For this reason, I have generally listed these together rather than following a strict alphabetical sequence. I have generally written the u with a dot over it as u, since the mark appears over a small fraction of forms in which it occurs, and it is not possible to create such a character here. Modern Magyar includes several digraphs, two character combinations which represent a single spoken sound. Such digraphs are indexed and alphabetized as seperate letters in modern dictionaries, but I have not done this in the list since it might cause confusion to non-speakers. I have also indexed w with v because of related variants. In addition to its unusual vowels, the 1574 work includes two consonantal forms which I have chosen to transcribe: an elongated s and a cursive z. This was done partly for ease of formatting, but also because variants occur in which the former is converted to s, and because where the latter character occurs it is in a position which would be occupied by z in modern East European languages (mostly following c or s). Those who make use of both this version of the list and the printed version should note that there are a number of differences between the two. Some of this is mere placement of text, but some includes orthography and content. The primary difference is in the name list itself. Simple accents over vowels are not indicated in this electronic version because of formatting difficulties. Such accents were generally rare in period documents, in any case. Umlauts and double accents are indicated by colons or quote marks where they would occur over a u or an o, but not over y. This electronic version includes some background material, as well as maps and a list of electronic resources such as the Hungarian Language Course, which obviously cannot be included in a printed version without considerable difficulty.